"Foreign Correspondent" — A "Masterpiece of Propaganda"
Johnny Jones (Joel McCrea) evades the Germans, er, the Borovians, by escaping through a window in the windmill where he's trapped. "Believing in motion pictures as an international force, I really wanted to see our work become a respected calling. I thought it was almost as important as the State Department." Though he was usually forced for economic reasons to produce more lighthearted fare (for instance, he produced the Marx Brothers' The Cocoanuts), that sensibility remained. Nevertheless, there was a literary property on his shelf that, he'd hoped, would satisfy his political urges. In 1936, he purchased foreign correspondent Vincent Sheean's memoir, Personal History, and burned through a busload of writers and over $140,000 trying to adapt it for the screen, all to no avail. And then he met Alfred Hitchcock. As mentioned in yesterday's post, Wanger greatly desired that the script be kept as topical as possible to reflect the current developments of the war heating up in Europe. Unbeknown to many, Hitchcock was already generously donating money and creative efforts to counter the German threat; he saw Wanger's project as an opportunity to do even more — and in grandiose Hollywood fashion. He jumped at the chance to work with the producer, tossed out most of the content of the book and eventually renamed the finished product Foreign Correspondent. There was, however, one snag. In the 1930s, the United States Congress had signed the American Neutrality Act, intended to keep America from involvement in foreign wars. This reached into Hollywood, whose censors under the Hays Office' Motion Picture Code prevented studios from making films that reflected a non-neutral bias. Still, both Wanger and Hitch had something to say — and they weren't about to let a few bureaucrats stop them from saying it. Like any self-respecting producer/director team, they gleefully set about creating workarounds. As Patrick McGilligan wrote in his 2003 biography, Alfred Hitchcock — A Life in Darkness and Light, "From the outset of the project, the director and his new producer got along like co-conspirators." Hence, though the Germans were rattling their spears in Europe, the creative team was prohibited from referring directly to the threat. Instead, the villains in the movie were identified as fictitious Borovians, intent (like the Germans) on forcing England into war. Another example: after his editor had given the reporter Johnny Jones instructions on whom he should interview in Europe, Jones naively suggested Hitler, not as a threat but as a news source. "Don't you think it would be a good idea to pump him? He must have something on his mind." The mere mention of Adolph Hitler linked the movie to real-life events. And that brings us to the picture above. 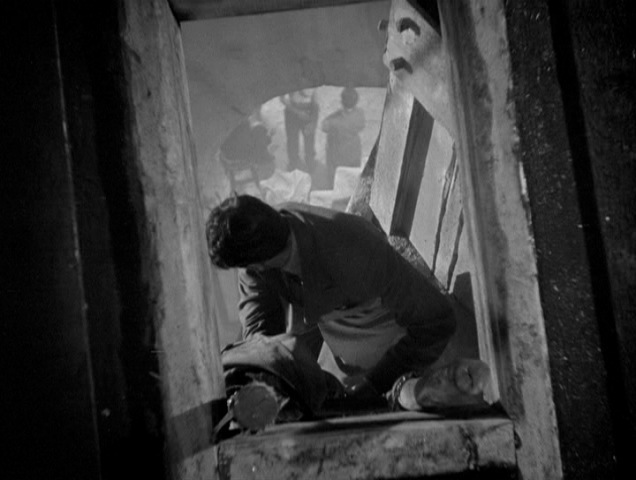 Hitchcock planted an image of Hitler's profile into this shot of Jones climbing out of the window of a windmill outside Amsterdam. Look in the upper right corner and you'll see the Fuhrer's famous slicked-down hair, eyebrows and mustache. "It's too late to do anything here now except stand in the dark and let them come... as if the lights were all out everywhere, except in America. Keep those lights burning, cover them with steel, ring them with guns, build a canopy of battleships and bombing planes around them. Hello, America, hang on to your lights: they're the only lights left in the world." "The emotional impact is overwhelming and it is not at all neutral. Indeed, it can be taken as a subtle, filmic representation of Winston Churchill's widely quoted words that 'in God's good time,' the New World, 'with all its power and might,' would step forth to rescue the old"
— words spoken only weeks before the scene was filmed. Despite the censors breathing down their necks, Hitchcock and Wanger managed to pull off a military-evangelism coup. The film was successful both commercially and as a propaganda piece, and that is powerful combination — after all how effective would propaganda be, without an audience to receive it? Furthermore, audiences got the coded message. The connection was so obvious that they were unaware that the film was not about the Germans. None other than Nazi Germany's minister of propaganda Joseph Goebbels declared it "a masterpiece of propaganda." As such, Foreign Correspondent can be a bit confounding for Hitchcock fans who see his films as morally relative, implicitly neutral, playing both sides of the fence. Wasn't this type of movie rather uncharacteristic of Hitchcock? Hmmm. Let me give some thought to this and get back to you in my next post. holy wow I never noticed that Hitler image! Uncharacteristic or not I love this film, great insight thank you. I think an argument for moral relativism could be made here. In the name of suspense he made Herbert Marshall's character a bit more grey than your your usual black and white villain and Ffollet is definitely a good guy, but a complicated one. The "Hitler" image looks more like Grouch Marx than Hitler. The moustache goes around the corner of the mouth, which Hitler's did not. If Hitchcock was really trying to plant a Hitler image here, he didn't do it all that well.